Trolling, Santa Claus, and koala pandemics: The week’s most interesting Slate stories. 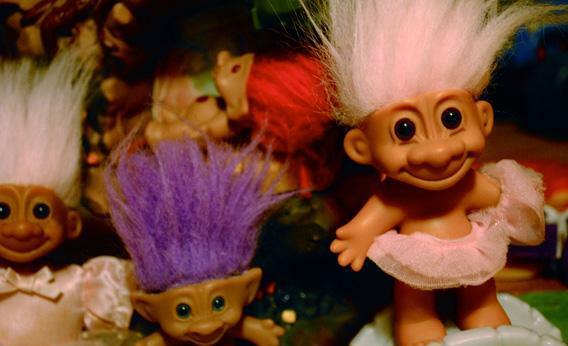 “Stop Calling Me a Troll: Just because you disagree with me doesn’t mean I am one,” Farhad Manjoo. When Manjoo says, “Won’t someone take iTunes out back and shoot it?” he is being sincere as well as extreme. So does he count as a “troll?” Manjoo argues that we use the word trolling so much, it has lost all meaning. “The Santa Lie: Is the big Christmas con hurting our kids?” by Melinda Wenner Moyer. Letting your kids believe in Santa might actually increase their scientific reasoning skills. In her inaugural post for Double X’s parenting advice column, Moyer defends the great conspiracy. “The Chutzpah of Bibi Netanyahu: Israel’s prime minister says diplomacy is war, criticism of Israel is anti-Semitism, and West Bank settlements aren’t unilateral,” by William Saletan. After losing last week’s U.N. vote on Palestinian statehood, Bibi Netanyahu is accusing the rest of the world of anti-Semitism. Saletan dismantles his recent statements on Israeli settlements. “Past Pandemics Are in Our Genes: What koalas can teach us about human evolution and disease,” by Carl Zimmer. Koalas are dying of a bizarre virus that has inserted itself into the koala genome. And they’re not the only ones—we have 31 viruses in our genome, too. Zimmer explains what koala diseases can teach us about human pandemics. “Hipsters Who Hunt: More liberals are shooting their own supper,” by Emma Marris. If you crave red meat but feel guilty about factory farming, grab a rifle and go after some deer. Marris tries to convince lefty hipsters to take up hunting. “The Dark Dangers of Tunnel Vision: Why police and prosecutors suspect the wrong person—and then dig in,” by Emily Bazelon. As a pair of wrongful convictions—one overturned, one not— show, prosecutors often focus on early evidence in a case and ignore anything that doesn’t fit with it.. “‘The Socially Awkward Do It Better’: Meet the hip geeks who outwitted Mitt Romney and the Republicans,” by David Weigel. Obama’s win was a revenge of the nerds—at least, that’s what the victors concluded at RootsCamp, a post-election conference for progressive campaigners. David Weigel explains what they learned about campaign spending and ad buys. “Congress Promotes Dangerous Anti-vaccine Quackery,” by Phil Plait. Scientists agree that vaccines do not cause autism, but Congress still held hearings this week questioning whether they do. Plait warns about the dangers of anti-vaccination efforts. “Are Mammograms Useless? A new study claims mammograms overdiagnose breast cancer,” by Meri Kolbrener. After 30 years of increased mammogram screenings, there has been no decline in the number of late-stage breast cancer diagnoses. In this provocative piece, Kolbrener, a physician, wonders if she should keep encouraging her patients to get yearly mammograms. “Don’t Raise the Medicare Eligibility Age: Kicking people off Medicare would cost patients about twice as much as it would save the government,” by Matthew Yglesias. Lawmakers want to make a higher Medicare eligibility age part of the debt reduction deal. Yglesias offers a different path forward. “What Should You Do if You’re Pushed Onto Subway Tracks? Think fast,” by Brian Palmer. What should you do if you’re stuck on the subway tracks? It’s hard to say—either squeeze between the train and the platform, hide between the two sets of train tracks, or lie flat. Palmer explains why all the options are pretty terrible. “The Power of Powers of Ten: How the Eames’ experimental film changed the way we look at Chicago—and the universe,” by James Hughes. The iconic 1977 short movie Powers of Ten inspired math and science students for generations. Hughes explains how they filmed it.